Will Google crawl new gTLDs? Will new gTLDs automatically score higher in Google's search algorithms? What are the SEO best practices for migrating a site to a new gTLD? Should brands REALLY get on new gTLDs and give up the status quo? Let's address them one by one. 1. Will Google crawl new gTLDs? The answer is simple: YES. Rumors were going around a while ago that a new site (on a new domain) may not get ranked as well as a site that has been registered on a domain, say, for three or more years. Google's staff explained clearly in this video that Google will crawl new sites and determine the search ranking based on the relevance of the site content, not the age of the domain the site is on. 2. Will new gTLDs automatically score higher in Google's search algorithms? As many new gTLDs are in fact common search keywords, it is only natural that sites on these domains will have an advantage in search results (as they are "exact match domains" or EMDs). Additional examples where sites on new gTLDs outrank legacy domains are being reported, such as coffee.CLUB being ranked on the first page of search results a week after launch. Finally, do not underestimate the relevancy-power of restricted gTLDs, where verification is required. Let's use the ".organic" example again: for the new .ORGANIC TLD, only certified organic products or entities that otherwise meet stringent eligibility criteria are allowed to use this web address. Sites on .ORGANIC are therefore almost guaranteed to have highly relevant content — they will be about organic products. Major brands such as Stonyfield, Applegate, Rodale Institute and many more have already signed up and are generating significant traffic. Since Google is all about content relevance, the company will automatically value the added relevance in their search algorithms. 3. What are the SEO best practices for migrating a site to a new gTLD? There are established best practices for site migration that you may wish to follow. For instance, always use 301 redirects initially — any other kind connotes a temporary change. Handle redirects at the server level — don't attempt to manage them via your CMS. And construct a friendly and informative 404 page for your visitors — even in the best planned migrations, a few odd pages won't get addressed. Check out Google's tips on the use of Change of Address Tool as well. You may also consider migrating sections of your current site to the new gTLD, i.e., building a site on the new gTLD with specific, highly relevant content to that gTLD. For instance, if you are a mega food company and you have a specific organic product line, you may want to build out a new site on the .ORGANIC domain that focuses JUST on your organic products. This way, your .ORGANIC site will be all about organic products and should score well from keyword search to content relevance. You can cross-link between your main and .ORGANIC sites so your customers always have access to your complete portfolio. 4. Should brands REALLY get on new gTLDs and give up the status quo? In the face of ever-increasing data on the Internet, even Google struggles to index and reflect relevance accurately. There have been repeated changes to Google's search algorithm — Panda, Penguin and hundreds more small tweaks that don't warrant an official title. Google also hasn't been shy about benefiting its own properties via search, as in when the company promoted Google+ content above other social media properties. And Google has started tailoring search results based on analysis of email traffic sent while the user is logged into Google services. This should benefit new gTLDs, since those with an intense interest in a topic will likely seek out sites with corresponding TLD domain. New gTLDs are a revolutionary way to organize an ever-growing and often chaotic cyberspace. Google and other search companies are now including them in their analysis. Google itself has applied to operate over 100 new gTLDs, investing millions of dollars and playing a prominent role in new gTLD implementation. The company clearly sees the potential power and ability of a wider range of gTLDs to change the game online. With a mission "to organize the world's information and make it universally accessible and useful," Google is quickly changing to adapt to the new global addressing and organizational structure. Google knows the new gTLDs have changed online marketing — so should you! Now is the time to re-evaluate your online marketing strategies and start leveraging the gTLD that best represents your business and brand! sure, all of us who make a living on the new gTLDs want them to perform well in search, and it's tempting to show all the evidence confirming this assumption (heck, I even blogged about these case studies some months ago on our blog). In this case though the evidence is very thin. 1) The Searchmetrics case study, as they also admitted, was based on very few data. 2) The coffee.club observation, which was mentioned first at TheDomains, was based on someone's personal search settings in Google. Try the incognito mode and you will find it on page 5 when searching for coffee club. The good news is that a new gTLD does not have less chances than a .com to perform well in Google search, but it will depend on the quality of the website. Hi Christopher. Yes – totally agree that the quality/content relevancy of the web site is critical in determining search results, which is also a key point in my article. 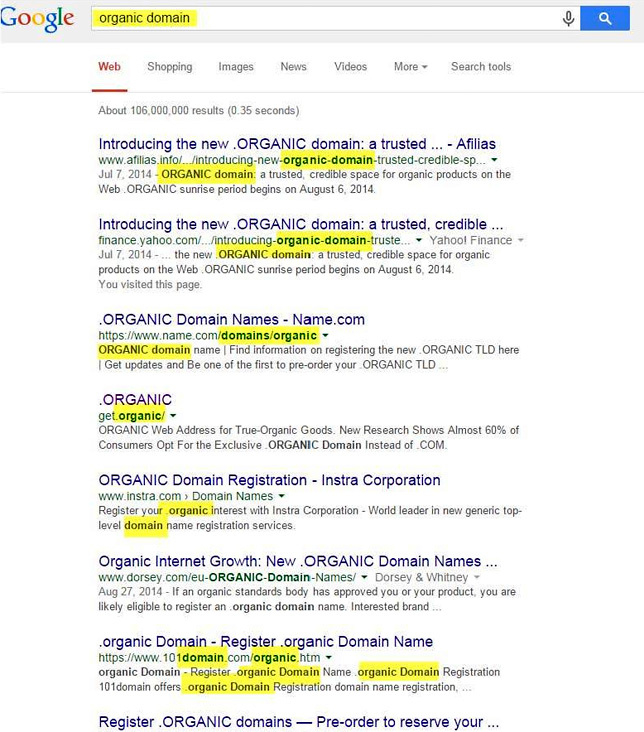 Sites on a restricted TLD like .ORGANIC, for instance, will be about organic products (or they won’t even be able to get a name on that domain). Sites on other TLDs are also likely to be about the topic/keyword of that TLD. Thanks for bringing up coffee.club: I did search for it in incognito mode and it is showing up as the second organic search result. We know even in incognito mode, people still see different search results (for reasons like location, and I am in the U.S. while you are in Europe I believe.) Thanks again for the clarification. I did the incognito mode for US results and it actually turns up in the last position on page 1. Pretty good for a very competitive keyword. However, the ranking is due to the massive number of backlinks obtained over the last months from all the sites talking about their agreement with dot club. A normal site will rarely get the same kind of promotion from very authoritative sites. What's interesting to mention is that they rank for coffee club without using this key phrase anywhere on the front page. More than 80% of the backlinks' anchor text is coffee.club, which could underline that Google actually sees the domain name as a two words term. If you don’t intuitively know the answers to the four questions, you should find a different career; SEO is not for you! Nevertheless, the study, unfortunately, does not rely on any statistical analysis. Local Time: Friday, April 19, 2019 03:56 AM PDT – Page Load: 0.3655 Sec.